There has been a growing concern over the slow state of developing auto technologies. In the wake of a world that is increasingly digital, there has been an unspoken cloud of dissatisfaction when it comes to bringing new exciting technologies to our cars. Driverless cars are ambitious, but they are still far off. Apple has however allowed us to dream again. Infotainment systems have so far left something to be desired. Their exaggerated complexity has been their undoing. As far as user friendliness goes, smartphones have got it figured out. This perhaps explains why Apple sought a simple solution to a long-standing problem. 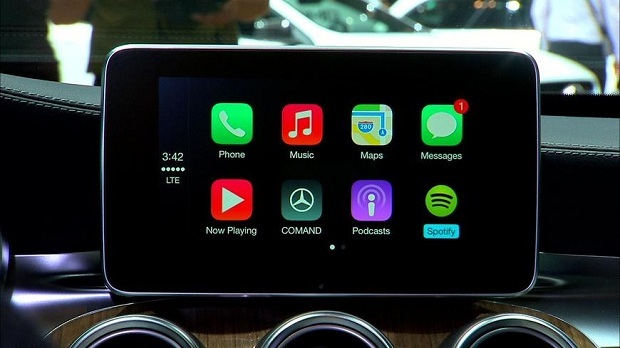 Announced at the start of March, CarPlay is an in-car system that allows a seamless connection with your iPhone. While Bluetooth has in the past enabled such kind of a car-phone relationship, CarPlay moves a step further by essentially extending your iPhone’s (5, 5s, 5c) functionalities into the car. Using Siri– This intelligent assistant is the most effortless way of controlling the CarPlay system. By using a series of voice commands, you can do everything from receiving phone calls, to playing your favourite music tracks and getting navigation assistance. She is intelligent, unarguably, but she sometimes struggles with different accents. Using The In-Built Touchscreen Display– Most new-age cars come with a lovely touchscreen built right into the dashboard. It provides a point of input where you can launch and close apps like you normally would on your phone. Given the hands-on characteristic of this option, it enables you to conduct tasks that you normally wouldn’t be able to using voice commands alone, such as setting your sat-nav for a specific destination. The interface remains simple, so anyone familiar with iOS will find the transition effortless. Using Knobs On The Steering Wheel- The physical buttons on the steering wheel can be used too. While they aren’t many of them, they do allow you to receive calls, adjust volume and change tracks very conveniently. The idea however, is to use all three as necessary. This way, the shortcomings of one can be compensated by the other. Apple is encouraging third parties to develop apps with CarPlay compatibility to increase its functionality. The technology has not yet made its way to the roads just yet. However, enthusiastic players in the auto industry such as Mercedes, Volvo, Jaguar and Ferrari have promised to release models where the system is intuitively supported. Other manufacturers such as BMW, Land Rover, Nissan, Toyota, Suzuki, Chevrolet, Ford and Kia have ascertained of their commitment and will be offering models that are supportive too. Suffice it to say that 2014 will have its fair share of CarPlay vehicles as most major players have already signed on. You can’t help but feel that CarPlay is a step in the right direction. Instead of making a unique infotainment system for each special car, it is more feasible to make a system that can work with our digital devices. This is the kind of out-of-the-box thinking that will bring even more practical technologies. It does have its limitations. CarPlay is not driverless technology though, so you will still need to control everywhere your car goes. The interplay does not extend to controlling the car’s functions, such as turning on the windscreen wipers or setting the climate control. Such an idea cannot be deemed implausible if CarPlay gets a few years to evolve. There are a few concerns though, that CarPlay might be distracting, given how robust its functionalities are. It’s easy to get distracted when using such an engrossing system. But the presence of Siri indicates a foreshadowing on Apple’s part. Since it’s a hands free, eyes free kind of assistant, the chances of losing sight of the road are close to none. Google probably isn’t far behind with its in-car technology. With its ambition for driverless cars, it is safe to assume the company has something in the works already, and should be announced before long. William James Jack takes interest in writing about cars. He has covered various car related topics like Cars on Finance, used car finance, buying cars, etc. When he gets time, he tries his best to utilize in long driving.